Growing up I was a bit of a card and board game nut. When my twin brother and I weren’t playing them, we were designing our own. 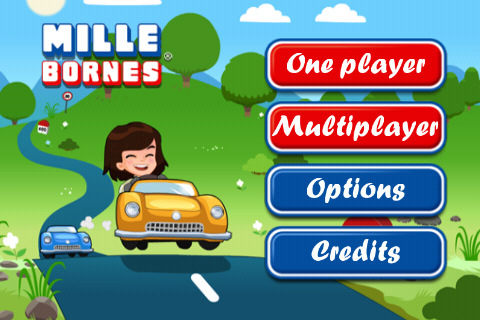 One card game that I fondly remember is a French game called Mille Bornes® (which means 1000 Miles or 1000 Milestones). First designed in 1953 by Edmond Dujardin, Mille Bornes® was apparently inspired by an earlier American card game called Touring, though I am unfamiliar with that title. I was first introduced to the game by a teacher in grammar school and I instantly took to its mix of strategy and luck. The visual style of the game is quite nice, clean and inviting on both the iPhone and the iPad. I applaud Dujardin for resisting the urge to modernize the cards with a “fresh new look” and instead they’ve retained their original classic look. You are represented as a cartoon avatar in his/her race car and you even have the ability to use your own photo for the face. 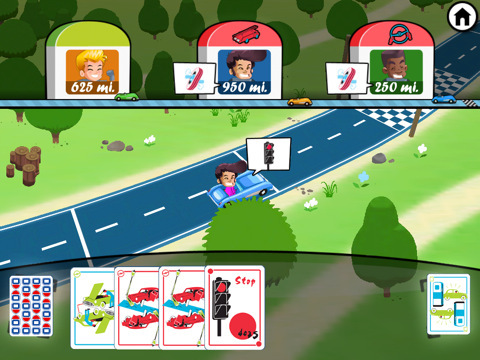 There is horizontal view of the track which shows each player’s current position, as well as an isometric view where you see your car take damage as hazard cards are played or race around the track as distance cards are played. Cute sound effects accompany these animations as well. Your cards laid out at the bottom of the screen with the ‘draw’ and ‘discard’ piles at either end. You drag a card from your hand to one of the other players (if it’s a hazard card) or to yourself to play a Safety, Remedy or Distance card, or to the discard pile. My one complaint here is that there is no way to see how many cards are left in the draw pile. In a real game of Mille Bornes® you’d have some idea of how many of the game’s 112 cards were left by the size of the draw pile. There are both single player and multiplayer options. Single player mode offers the ability to have up two three AI competitors in either Normal or Expert difficulty levels. To be honest I saw really no difference in the difficulties other than on Expert mode the AI player seemed to get a lot more of the Safety cards, but that may have just been a coincidence. Some retooling of the AI players needs to be done as no matter the difficulty, they are usually pretty easy to beat seeing as they make a lot of illogical and frankly…dumb moves. As for the multiplayer, up to four players can participate either via pass and play on the same device, or via Bluetooth with each player using their own device. Unfortunately there is no online multiplayer. It would seem that this would be a natural choice and I hope to see it added via Game Center in the near future either with a real-time or perhaps an asynchronous approach would work as well. This iOS incarnation follows the traditional rule set, but also offers an express mode where you don’t score, it’s just the first player to reach 1000 miles who wins. At the end of a game, a summary screen pops up for each player showing their totals, with points earned for number of miles traveled, Saftey cards played, no 200 mile cards played, etc. and then the total of all players. Depending on the game play options you’ve selected, you will then start the next round or a winner will be declared. 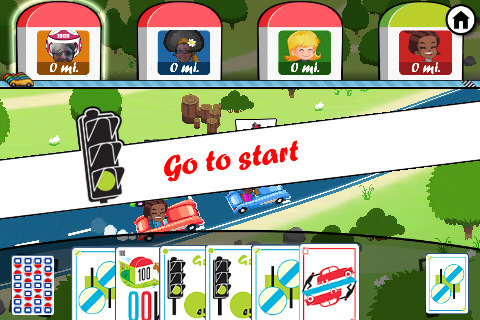 Mille Bornes® can be a bit overwhelming for new players to learn, but usually playing through a few sample rounds will give you the basics, with players developing personal strategies over time. The lack of tutorial may make it difficult for new players to pick up and play the game. There is a full instruction set accessible within game, however it is in desperate need of a makeover. It is literally just 33 separate screens, each with a paragraph of text, no indexing or quick links to jump to specific sections. Parker Brother’s instruction PDF from their physical release of the game is a much better place for newbies to start. One odd thing worth mentioning (since it may confuse App Store buyers) is that the title comes in two separate releases 1000 Bornes® HD (which is billed as the ‘iPad‘ release) for $6.99 and Mille Bornes® (billed as the ‘iPhone‘ release) for $2.99. The thing is that both titles have the same icon, are the same size, have had the same updates and both are universal apps! As far as I can tell, there is no difference between the two, so I’d recommend sticking with the $2.99 Mille Bornes® version. Aside from the lack of online multiplayer and easy to beat AI players, Mille Bornes® is a really faithful and visually appealing implementation of this card game. I hadn’t played the game in quite a number of years and it rekindled my love of this classic. If Dujardin could just find a way to address the couple of issues which I had, I think they’d have a truly great game on their hands. Newbies may feel a little lost due to the lack of tutorial and daunting instruction set, but Fans of the card game will find a lot to love about the game, just don’t expect much of a challenge unless you go head to head with a living, breathing opponent.